The new Provo City Center Temple is by far one of the most unique and beautiful temples of the Church of Jesus Christ of Latter-day Saints. The exterior of the temple was built from the burned out remains of the old historic Provo Tabernacle, completed in 1898. To help preserve the historical integrity of the old ravaged Tabernacle, the church architects sought to incorporate many of the details from the original building. Here are just a few of those interior details that one may observe while visiting the temple. One of the first things that you will likely notice is the many beautiful stained glass windows. The original Tabernacle had several window designs, including beehives, an open book of scriptures, a single candle flame, and several different flower motifs. For the most part, the outside window designs are the same as the original, minus sandstone panels that were added to the main floor windows because the ceiling had to accommodate duct work between the floors. When the Tabernacle was being built in the 1890s, electrical lighting was still an emerging technology. Thus, exterior and interior windows were used extensively to naturally light the Tabernacle. The new temple replicates this traditional lighting technique by having the interior rooms lit through a serious of windows on the exterior. In addition, the design of the interior windows replicates the same design as the closest exterior window, in other words, if the closest outside window uses a book of scriptures as the design, the interior window will also show this same motif. Though not original to the old Tabernacle, a beautiful 120 year old stained glass window was installed in the main entryway. The window depicts Christ holding a lamb and is patterned after the illustration by O.A. Stemler (1872-1953) entitled The Good Shepherd. The window originally was from a Presbyterian Church in New York, which was then purchased by a member and donated to the Temple. A very similar window can be found in the First United Methodist church of Salt Lake City. The design of the door handles, push plates and hinges were inspired by the floral and scroll motifs found in the stained glass windows. In particular, the door handles of the Celestial room are an almost exact duplicate of the beehive style windows. Notice how the metalwork incorporates the beehive, the gothic arch, the flower-bud pillars and bases, and the decorative scroll pattern on the bottom. In addition, the door handles include an acorn on the top and bottom, a design found in the original door handles of the old Tabernacle. The woodwork in the new temple is, to say the least, stunning. 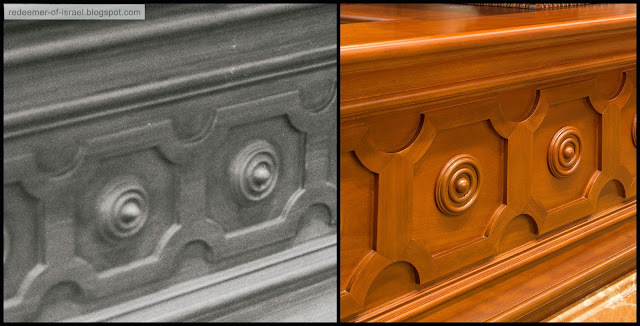 One of the most notable details is the newel post design that was replicated from the original Tabernacle. These posts can be found throughout the temple, including in the railings around the baptistry, the grand staircase, and in the waiting area. A similar acorn pattern as found on the top of the door handles, was also used on the corners of the altars and corner woodwork of the sealing rooms. The gothic arch is also another dominate feature within the new temple and can be found in the hallways, the windows, and other woodwork. One gothic arch motif in particular is based off of the woodwork of the original organ base and was replicated in the terrestrial room (including in the altar, walls, and chairs), the celestial room, and in the sealing rooms. As with most temples, the Provo City Center temple includes the circle and the square motif in many of the wood details. The circle represents eternity, and the square represents earth, or the four corners of the earth, thus the symbol shows how heaven and earth combine within the walls of the temple. Of similar design is the eternal circle pattern, found on some of the furniture in the Celestial room. When workers were combing through the wreckage of the Tabernacle, they discovered some of the original stenciling patterns found beneath layers of paint on the burned walls. The design was incorporated into the stenciling of the bride's dressing room. Workers also found burned pieces of old Victorian style wallpaper. A similar patterned wallpaper was used throughout the temple to replicate this historic detail. William Folsom, the architect of the original Provo Tabernacle, also designed the Manti Temple and the Assembly Hall, among other buildings. Many of the architectural details from these two buildings were likewise incorporated into the design features, including the stencil designs and woodwork of the Terrestrial and Celestial rooms. As part of the endowment ceremony, participants learn about the plan of salvation, and how to return back to the presence of God through the atonement of Jesus Christ. Much of the design and architecture of the various rooms of the endowment symbolically convey the concept of moving from an earthly existence to that of heaven. When you begin the endowment, you start in one of two rooms on the main floor. Both rooms have beautiful murals that depict the various days of creation shown as you progress around the room. It is worth noting the cougar, BYU's mascot, in one of the murals, perhaps playing to the fact that both painters are BYU alumni. As you move from this first instruction room, to the second, and on into the Celestial room, one climbs the spiral stairs to the next floor, finding that the ceiling height, size of the room, amount of light, and ornate woodwork has increased with each new room. Again, this design aspect is to show our symbolic progress moving heavenward back into the presence of God. The ancient Tabernacle of Moses was designed to have three levels of progression, the outer court, the holy place, and the holy of holies, moving from east to west as you progress towards holiness. 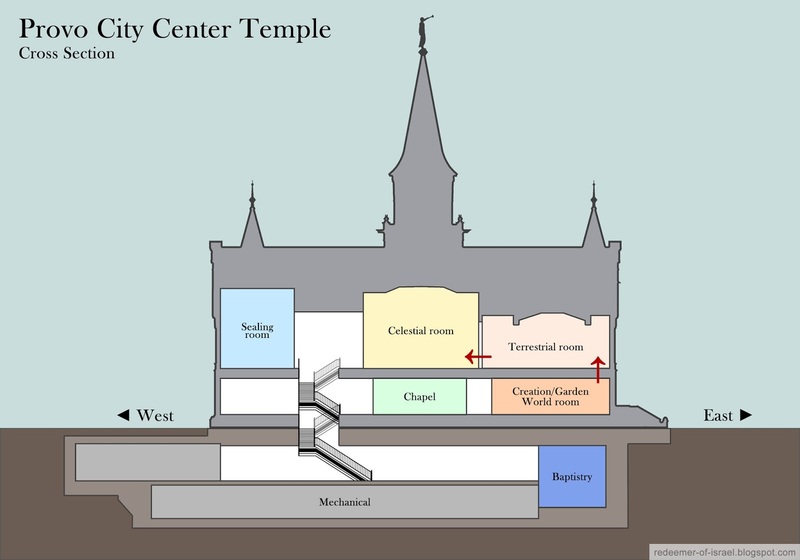 The new Provo City Center temple incorporates a similar three level progression, with the progression from the Terrestrial to the Celestial room in a westward direction, the same direction as the ancient Tabernacle of Moses. Another unique aspect of the endowment rooms is the use of bench style seating. From behind the rows are designed to look like the old tabernacle pews, but from the front, they are individual cushioned seats. As a final last note, when you visit, make sure to notice the interior lights and lamps. There are numerous types of old oil lamps, converted to electric, to help add to the historic feel of the building. Even the modern exit signs were modified, giving them a more Victorian style look so they would better fit the style of the building. The new Provo City Center temple is truly amazing. It is a beautiful tribute and monument to the sacrifices of the early pioneers who built the first structure, and to the Lord, whose house it is. Special thanks to Brian Olson who shared his plan elevation of the temple, and for his many insights about the plans and architecture of the new temple.